The Tektronix P6700 Series optical-to-electrical (O/E) converters change optical signals into electrical signals for convenient analysis on Tektronix DPO7000 and DPO/DSA/MSO70000 Series oscilloscopes with appropriate adapters (see footnote 1 and 2), any other Tektronix oscilloscope equipped with a TekProbe interface, or when used with the 1103 TekProbe power supply. The P6700 Series O/E converters are ideal for optical source characterization in the development, manufacture, or service of optical communication systems and devices. Small, conveniently packaged P6701B and P6703B optical-to-electrical analog converters provide an accurate interface for optical pulse shape measurements. The high gain, large dynamic range, and stable output offset of these O/E converters make them ideal for performing eye pattern analysis and extinction measurements. The P6701B/P6703B optical input is a 1 meter, 62.5μ Multi Mode fiber with an FC/PC connector. 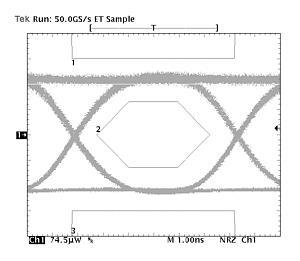 Using the standard assortment of hybrid fiber-optic mating sleeves, these O/Es can accommodate the various industry connector standards. The TekProbe interface provides power, auto-scaling, auto-termination, and correct units (microwatts) when used with Tektronix DPO7000 or DPO/DSA/MSO70000 and earlier TekProbe-equipped Series oscilloscopes. *1 Requires the TPA-BNC adapter. *2 Requires the TCA-BNC adapter. OC-3/STM-1 SONET/SDH Transmitter Eye Pattern Test. P6701B: Typical Wavelength-dependent Gain (at 25 °C). 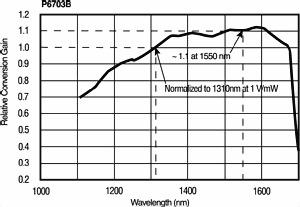 P6703B: Typical Wavelength-dependent Gain (at 25 °C). 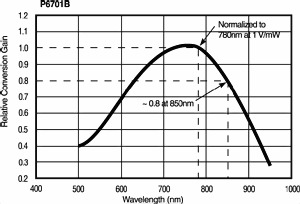 The standard P6701B has a nominal frequency response which follows the fourth-order Bessel-Thompson for Fibre Channel 1063 Mb/s. The 1103 TekProbe power supply can be used to connect these products to the DSA8200 Series sampling oscilloscopes.